Indeed, Robert. The other half of fixing the mess created by taxation is to ensure that government dedicates its revenue to NECESSARY spending only. Governments of all persuasions fail in this aim. You’re also correct that rent is captured indirectly by taxation, Robert. I take the position, first things first: we’re having another economic depression because we chose the more indirect method of taxation instead of taking revenue directly from its natural source. Taxes give all the wrong signals. They create deadweight and economic recessions and depressions. Rent capture doesn’t. So, I’ll cheer as any government goes directly to rent for its revenue. NOW for land rents (which the Rudd government says it’s not interested in capturing at all.) THEN, to keep governments honest in spending. There’s enormous scope for many people to become involved in holding government to account for either project. Good point Bryan that we own our resources. But I wonder whether we should entrust our rent to governments, which are very good at wasting money? I suspect that much of the resource rental captured by mining companies is returned to the community in other ways, not readily apparent. For example: retirement income sourced from dividends; and capital growth in superannuation funds as company earning rise. 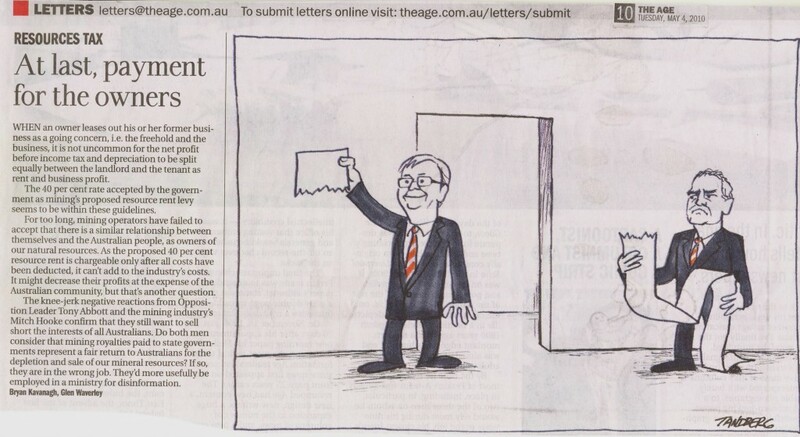 Rudd is desperate for money, having wasted it on the most worthless projects in the name of the GFC. The opportunity to grab resource rents was too good to ignore, especially as it comes with almost no political liability.